The tear trough deformity is a natural consequence of the anatomic attachments of the periorbital tissues. A variety of techniques have evolved to address this cosmetic issue. Traditional techniques relied on surgical excision of skin, muscle, and fat as well as chemical peels. More recently, surgeons have better appreciated the need for restoration of volume of the orbit as part of an overall rejuvenation strategy. Treatment is now tailored towards specific anatomic abnormalities and often employs multiple modalities including surgery, botulinum toxin, and replacement of volume. A numerical score was then assigned with respect to severity, depth of the tear trough, distance from the anterior lacrimal crest to the depth of the trough; each millimetre of depth is given one point. Dyspigmentation, although not directly contributing to the depth of the trough, creates an illusion of depth; no hyperpigmentation is given one point, mild is given two points, moderate hyperpigmentation is given three points and intense or deep hyperpigmentation is given four points; subdermal dark casting caused by venous pooling can also be graded as hyperpigmentation. Prominent prolapse of the nasal fat pad accentuates the depth of the trough and is rated as mild (one point), moderate (two points) or severe (three points). 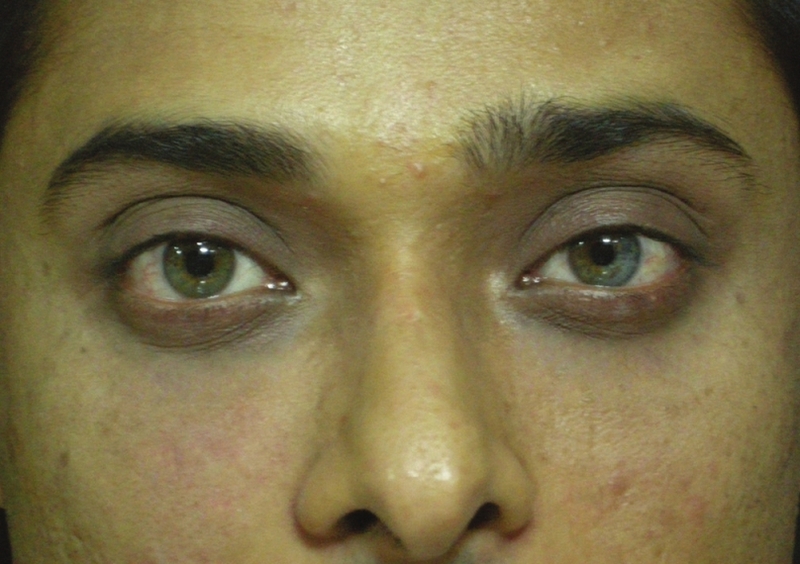 Lower eyelid skin rhytidosis accentuates the fatty prolapse and the depth of the trough; skin rhytidosis is rated on a scale of one to four (mild, moderate, advanced and severe, according to Glogau scale) and the rating corresponds to the number of points assigned. In 2010, Hirmand proposed a classification system of the tear trough deformity based on clinical evaluation  [Figure 3], [Figure 4], [Figure 5], [Table 2]. Vitamin E, gingko biloba, aspirin and nonsteroidal anti-inflammatory drugs (NSAIDs) should be avoided at least five days before the treatment to prevent bruising. 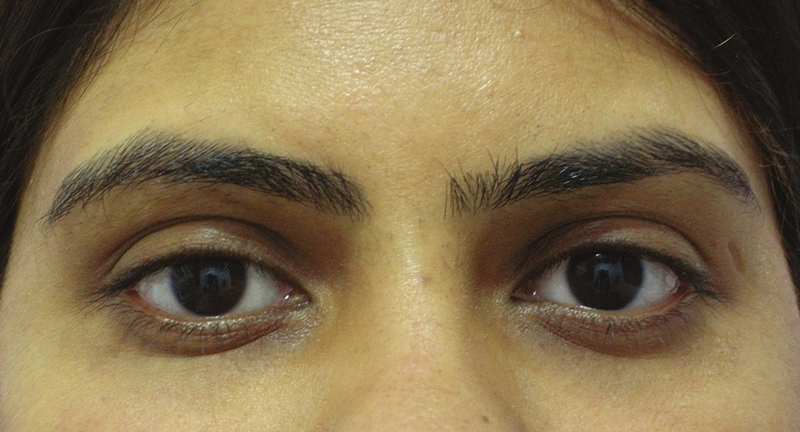 Care should be taken in patients with a history of lower eyelid blepharoplasty without lateral retinacular suspension. One should be cautious while injecting around the infraorbital foramen to avoid injury to the neurovascular bundle. Careful and gentle moulding of the implant for a more homogeneous distribution of the material is encouraged after injection to obtain an even distribution of the filler in the lateral part of the hollow. Skin quality, as patients with thick, smooth skin will have better results than those with thin extremely wrinkled skin. Definition of the hollow, as a more defined hollow is more amenable to fillers. 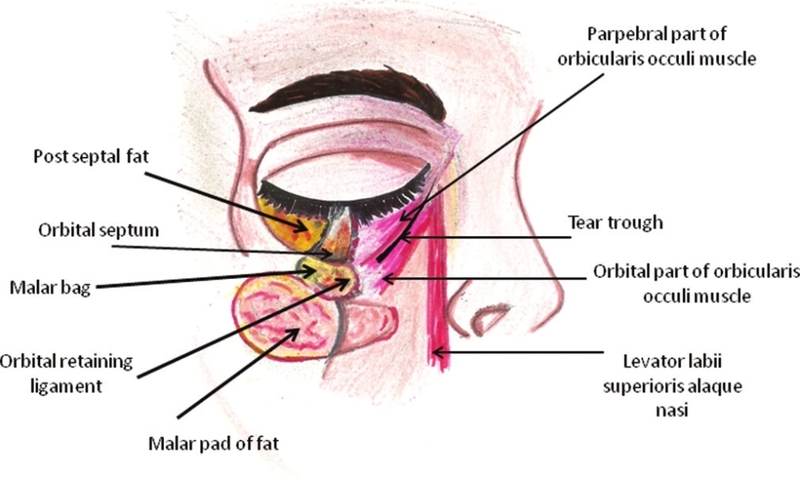 The orbital fat pad, as larger fat pads are more difficult to correct due to 'puffiness' caused by the injection. The colour of the overlying skin, as the filler may improve shadowing but will not improve dark pigmentation. 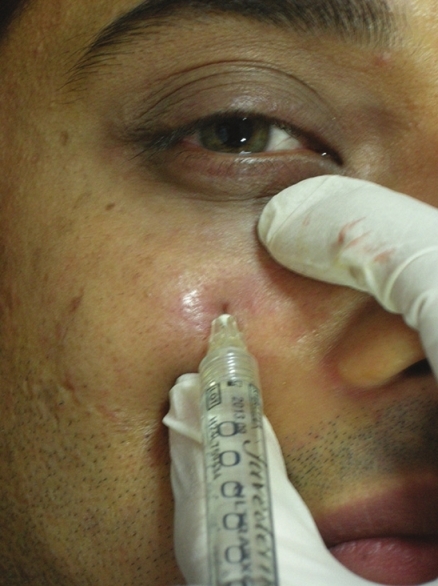 After application of an ice pack to the lower lid and cheek, a local anesthetic consisting of 0.5% lidocaine with epinephrine (0.2 to 0.4 mL) is injected into the orbicularis within the boundaries of the tear trough. Finger pressure is applied to flatten the area of injection. A half-inch, 30-gauge needle is inserted through the skin at the most lateral extent of the tear trough, advancing fully and potentially indenting the skin with the hub for full reach. The HA is then injected deep into the dermis as the needle is withdrawn. This process is repeated above and below the original site of the injection. The area is then inspected, and additional passes are made as needed to yield a smooth contour. Last, the area is massaged lightly, compressed with finger pressure, and rolled with a cotton applicator. In his description of the technique, Lambros stressed the importance of not forcefully compressing the product during massage, as this can displace the product into the cheek and exaggerate the tear trough. Postinjection care involves applying ice to the area the night of the procedure, and patients are instructed to refrain from massaging the area. 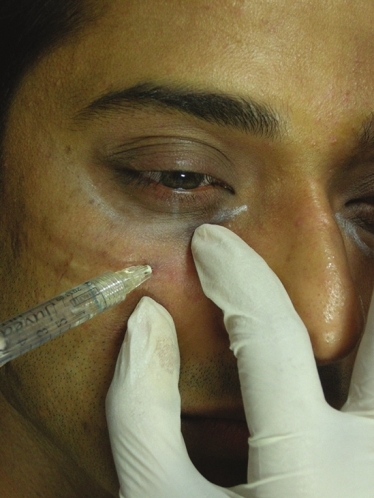 After evaluation and marking of the tear trough, betacaine topical anaesthetic ointment is applied to the lower eyelids at least 20 minutes before the injection. After preparation of skin with alcohol, a 30- or 32-gauge needle is inserted for injection. The skin of the lower lid is spread and held at some tension with the noninjecting hand. The skin is inspected carefully for visible vessels before each needle stick. The deepest portion of the medial tear trough is treated first. The needle is threaded below the surface of the skin above the orbicularis oculi. A miniscule amount of hyaluronic filler is injected at each pass. Parallel threads of the filler are injected cephalad and caudal to the tear trough. The raised area of the filler is then tapered off medially along the nasal sidewall superiorly at the most cephalad-significant rhytid, inferiorly at least abutting or immediately caudal to the thick skin of the cheek, and laterally to at least the junction of the medial and lateral third of the inferior orbital rim. If the tear trough is deep, the direction of the needle is changed throughout the injection so that the filler is applied in a cross-hatched fashion. 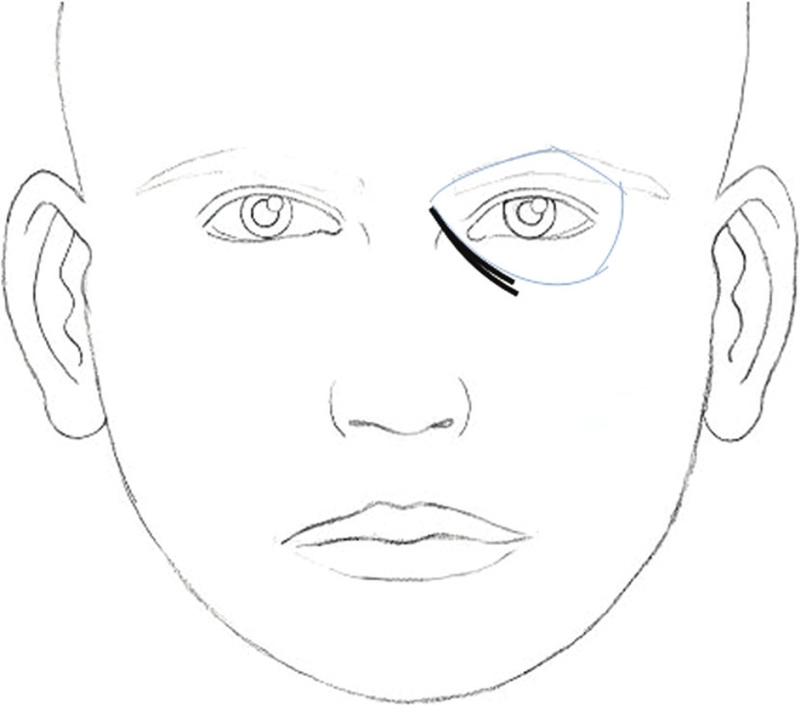 The volume range is 0.1 to 0.45 mL per eyelid, with most patients requiring 0.2 to 0.3 mL. To be able to teach others how to improve aesthetic outcomes in the midface and infraorbital hollows, a consensus group of European and North and South American aesthetic experts convened at an academic workshop to develop keys to optimal outcomes. The best practice guidelines for midface and infraorbital hollow injections were discussed. The consensus group recommend vertical supraperiosteal depot technique (VSDT) or linear threading for infraorbital hollow augmentation. According to the consensus team, the filler should be injected at the supraperiosteal level along or below the orbital rim under the defect or both, protecting the edge of the rim to prevent deposition of filler above that structure. Most of the filler should be injected underneath the orbicularis oculi muscle. However, the medial part of the muscle, which attaches to the bone, requires direct injection into the muscle itself. Serial injections using VSDT, implanting 0.02 to 0.05 mL per perpendicular injection point just above the bone 2 to 3 mm apart, are recommended. 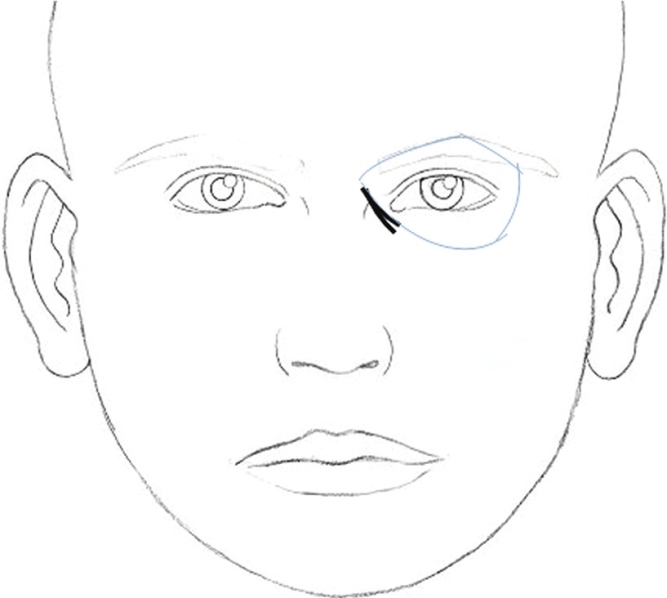 The linear technique is preferred if the cheek has been augmented well, using an entry point beneath the lateral and, in some cases, also the medial canthus. The cannula (or needle) should be placed perpendicular to the skin, advanced to the periosteum, and moved forward until it reaches the top of the nasojugal fold. This technique allows for deep injection using retrograde linear threading along the orbital rim, as described above. The injected volume depends on the severity of hollowing [Table 3]. Repeated injections may be required for optimal augmentation. Patrick Trevidic has reported the use of blunt-tipped cannulas for tear trough correction with HA fillers. Blunt-tipped cannulas are safer, because the chance of injuring vessels and nerves is smaller than with needles. It is less painful and produces less oedema. Patients on vitamin E, gingko biloba and NSAIDs are asked to discontinue the same for a week before the treatment to prevent bruising. All the patients are photographed with a standard powershot camera with the same settings and adequate lighting. Written informed consent is taken. The author prefers to inject with the patient reclined at 45Ί as the tear trough deformity is better visible in this position than when the patient is lying down. Good lighting is extremely important for better visibility of anatomical landmarks. The injections should not be given in a hurry as chances of hitting blood vessels or injecting superficially are higher when in haste. Any cosmetic makeup in the area to be treated is completely removed with a cleansing lotion. Cleansing is further done with chlorhexidine and normal saline. The area to be treated is numbed with ice cubes. The orbital rim is palpated. Due to the rich subdermal vascular plexus, the tear trough area is prone to significant bruising. Hence, the author prefers to keep the point of insertion of the needle about 1.5 cm below the orbital rim in line with the midpupillary line. This reduces the chances of bruising [Figure 6] and [Figure 7]. Cross-linked HA with lignocaine (Juvederm Ultra@ XC) is injected with a 30-gauge needle. Juvederm@ Ultra XC has a cross-linking process called Hylacross™ which provides a concentration of 24 mg/mL of HA. The 6% cross-linked composition produces a soft, viscous, nonbeaded gel which helps in smooth injection and is intended to enhance durability. It also has 0.3% preservative free lidocaine which helps in alleviating pain during and after the injection. The patient is comfortable during the procedure. Patient compliance improves as well. The needle is directed diagonally up towards the medial canthus and plunged deep into the skin through the muscle right up to the periosteum. HA is deposited subperiosteally to a visual end point of optimal correction. Protection of the globe is ensured by palpating the infraorbital rim with the noninjecting hand [Figure 8]. The needle is slowly withdrawn and the material is not injected while the needle is being withdrawn, as superficial injections are bound to give a Tyndall effect in this area. The direction of the needle is then changed vertically up towards the midpupillary line and plunged again into the periosteum. Another depot injection is given [Figure 9]. A third injection is given only if there is loss of tissue below the lateral orbital rim. The direction of the needle is changed diagonally up towards the lateral canthus to give another depot subperiosteally [Figure 10]. Usually about 0.2 mL is adequate per depot. The area is gently massaged for an even distribution of the product [Figure 11]. This also ensures that there are no lumps or irregularities. However, vigorous massage should be avoided in this area as it can push the substance onto the globe. Care is taken to inject away from any visible blood vessels in this area. Ice packs can be applied to the treated area to reduce oedema, bruising and discomfort. The patients are asked to avoid massage or any facial treatments for a week. The patient is asked to follow up in 15 days to see if a touch-up is required. HA is injected until the point of full correction, if necessary. The patients are asked to follow up again in 6, 12, 15 and 18 months. The observation of the author has been that a HA in the tear trough area usually lasts for up to 12-15 months [Figure 12], [Figure 13], [Figure 14], [Figure 15]. Low-viscosity HA can be safely injected to correct tear trough deformity. High-viscosity HA and nonbiodegradable agents should not be injected in the tear trough area. Injections must be at a supraperiosteal level of the orbital rim under defect. One should be cautious around the infraorbital foramen. The HA filler should be gently massaged for even distribution; strong massage should be avoided. 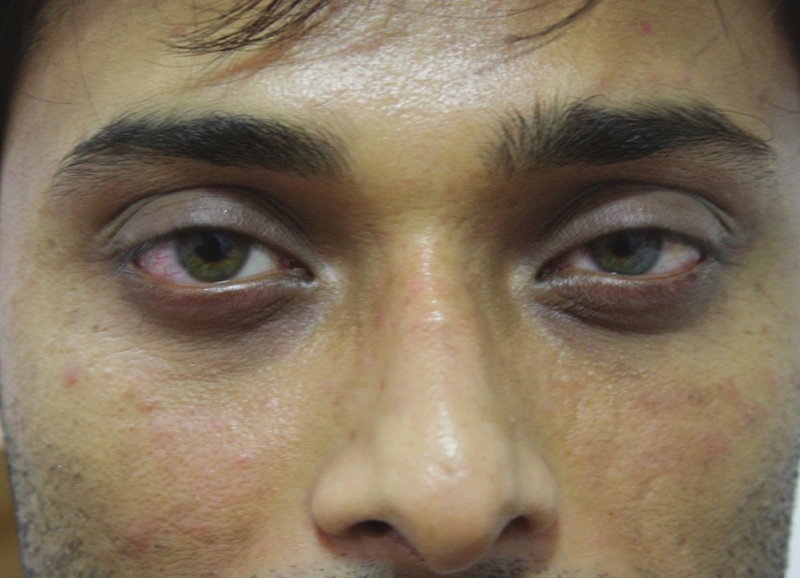 It is often seen in darker skin types due to bruising and haematoma. It may last for a very long period and can be difficult to treat. Though extremely rare, they can present as single or multiple erythematous and fluctuant nodules that are best treated with antibiotics active against frequent skin bacteria including Staphylococcus epidermidis or Propionibacterium acnes. Filler injections should not be performed if there is an infection in the adjacent site. Although extremely rare, this may be an under-reported complication. According to Coleman, blindness occurs due to migration of a filler embolus in a retrograde manner via an arteriole to an antegrade flow through the central retinal artery. Hence it is important to limit the amount of filler bolus injected in one site. One way to do this is to use blunt cannulas. The possibility of blindness also can be minimised by moving the needle tip, and by injecting slowly, with minimal pressure and minute quantities of the filler at a time. Tear trough deformity can be corrected with an HA filler. It is less invasive and there may be minimal downtime due to swelling and bruising. The volume injected varies from patient to patient and overcorrection should be avoided. Better results will be achieved if the patient is reassessed in two to four weeks and then additional treatment is performed to achieve complete correction. 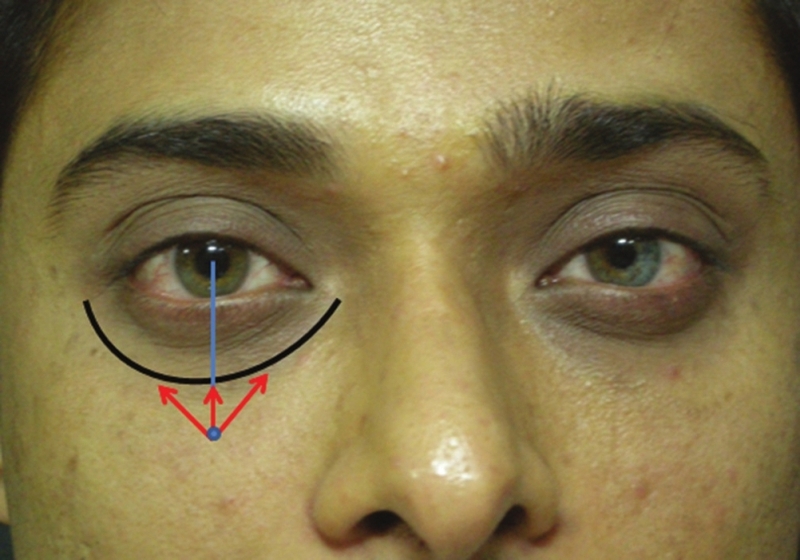 Care should be taken to avoid injection through the orbital septum (by staying -1 cm below the orbital rim), to avoid accentuating pseudoherniation. 1. Sadick NS, Bosniak SL, Cantisano-Zilkha M, Glavas IP, Roy D. Definition of the tear trough and the tear trough rating scale. J Cosmet Dermatol 2007;6:218-22. 2. Glaser DA, Patel U. Enhancing the eyes: Use of minimally invasive techniques for periorbital rejuvenation. J Drugs Dermatol 2010;9:S118-283. 3. Lambros V. Observation on periorbital and midface aging. Plast Reconstr Surg 2007;120:1367-76. 4. Goldberg RA, McCann JD, Fiaschetti D, Ben Simon GJ. What causes eyelid bags? Analysis of 114 consecutive patients. Plast Reconstr Surg 2005;115:1395-402. 5. Duke-Elder S, Wybar KC. The eyelids. In: Duke-Elder S, editor. System of Ophthalmology: Anatomy of the visual system. Vol. 2. St Louis, MO: C V Mosby CO; 1961. 6. Loeb R. Naso-jugal groove leveling with fat tissue. Clin Plast Surg 1993;20:393-400. 7. Flowers RS. Tear trough implants for correction of tear trough deformity. Clin Plast Surg 1993;20:403-15. 8. Haddock NT, Saadeh PB, Boutros S, Thorne CH. 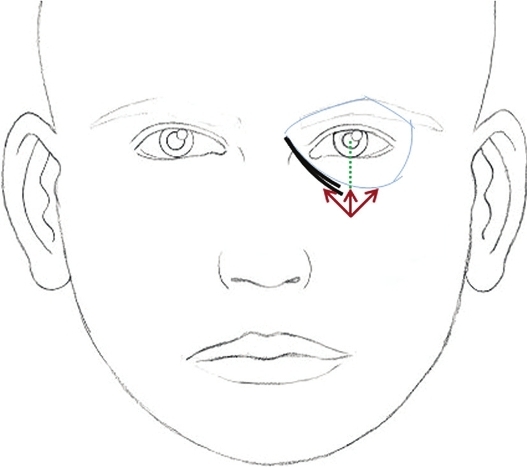 The tear trough and lid/cheek junction: Anatomy and implications for surgical correction. Plast Reconstr Surg 2009;123:1332-40. 9. Mendelson BC, Muzaffar AR, Adams WP. Surgical anatomy of the midcheek and malar mounds. Plast Reconstr Surg 2002;110:885-911. 10. Muzaffar AR, Mendelson BC, Adams WP. Surgical anatomy of the ligamentous attachments of the lower lid and lateral canthus. Plast Reconstr Surg 2002;110:873-84; discussion 897-911. 11. Ghavami A, Pessa JE, Janis J, Khosla R, Reece EM, Rohrich RJ. The orbicularis retaining ligament of the medial orbit: Closing the circle. Plast Reconstr Surg 2008;121:994-1001. 12. Espinoza GM, Holds JB. Evaluation and treatment of the tear trough deformity in lower blepharoplasty. Semin Plast Surg 2007;21:57-64. 13. Kane MA. 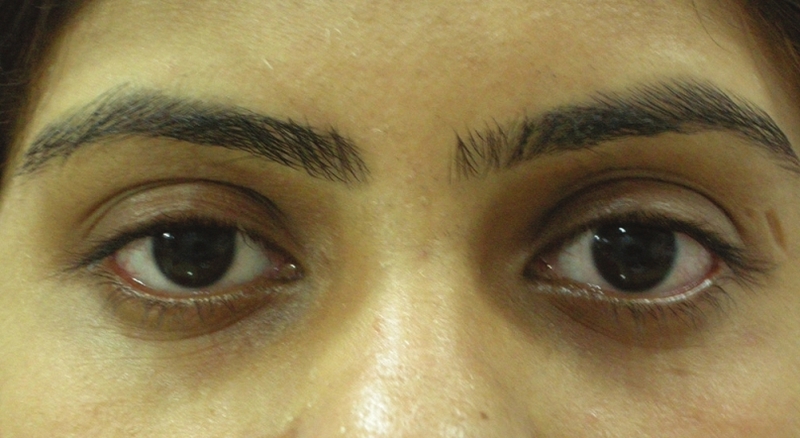 Treatment of tear trough deformity and lower lid bowing with injectable hyaluronic acid. Aesthetic Plast Surg 2005;29:363-7. 14. Wong CH, Hsieh MK, Mendelson B. The tear trough ligament: Anatomical basis for the tear trough deformity. Plast Reconstr Surg 2012;129:1392-402. 15. Barton FE Jr, Ha R, Awada M. Fat extrusion and sep- tal reset in patients with the tear trough triad: A critical appraisal. Plast Reconstr Surg 2004;113:2115-21. 16. Hirmand H. Anatomy and nonsurgical correction of the tear trough deformity. Plast Reconstr Surg 2010;125:699-708. 17. Lafaille P, Benedetto A. Fillers: Contraindications, side effects and precautions. J Cutan Aesthet Surg 2010;3:16-9. 18. Carruthers J, Rzany B, Sattler G, Carruthers A. Anatomic guidelines for midface volumetric augmentation. Dermatol Surg 2012;38:1223-33. 19. Matarasso SL, Carruthers J, Jewell ML; Restylane Consensus Group. Consensus recommendation for soft-tissue augmentation with nonanimal stabilized hyaluronic acid (Restylane). Plast Reconstr Surg 2006;117:3S-34S; discussion 35S-43S. 20. Dover JS, Rubin MG, Bhatia AC. Reiview of efficacy, durability, and safety data of two nonanimal stabilized hyaluronic acid fillers from a prospective, randomized, comparative multicenter study. Dermatol Surg 2009;35:322-31. 21. Carruthers J, Cohen SR, Joseph JH, Narins RS, Rubin M. The science and art of dermal fillers for soft-tissue augmentation. J Drugs Dermatol 2009;8:335-50. 22. Kablik J, Monheit GD, Yu L, Chang G, Gershkovich J. Comparative physical properties of hyaluronic acid dermal fillers. Dermatol Surg 2009;35:302-12. 23. Lambros VS. Hyaluronic acid injections for correction of the tear trough deformity. Plast Reconstr Surg 2007;120:74S-80S. 24. Stutman RL, Codner MA. 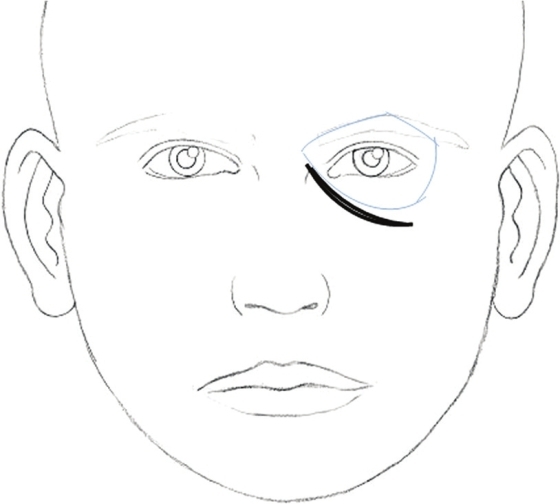 Tear trough deformity: Review of anatomy and treatment options. Aesthet Surg J 2012;32:426-40. 25. Steinsapir KD, Steinsapir SM. Deep-fill hyaluronic acid for the temporary treatment of the naso-jugal groove: A report of 303 consecutive treatments. Ophthal Plast Reconstr Surg 2006;22:344-8. 26. Sattler G. The tower technique and vertical supraperiosteal depot technique: Novel vertical injection techniques for volume-efficient subcutaneous tissue support and volumetric augmentation. J Drugs Dermatol 2012;11:45-7. 27. Rohrich RJ, Arbique GM, Wong C, Brown S, Pessa JE. The anatomy of suborbicularis fat: Implications for periorbital rejuvenation. Plast Reconstr Surg 2009;124:946-51. 28. Trevidic P. The use of blunt-tipped cannulas for tear trough correction. J Drugs Dermatol 2012;11:S38-40. 29. Gold MH. Use of hyaluronic acid fillers for the treatment of the aging face. Clin Interv Aging 2007;2:369-76. 30. Wang F, Garza LA, Kang S, Varani J, Orringer JS, Fisher GJ, et al. In vivo stimulation of de novo collagen production caused by cross-linked hyaluronic acid dermal filler injections in photodamaged human skin. Arch Dermatol 2007;143:155-63. 31. 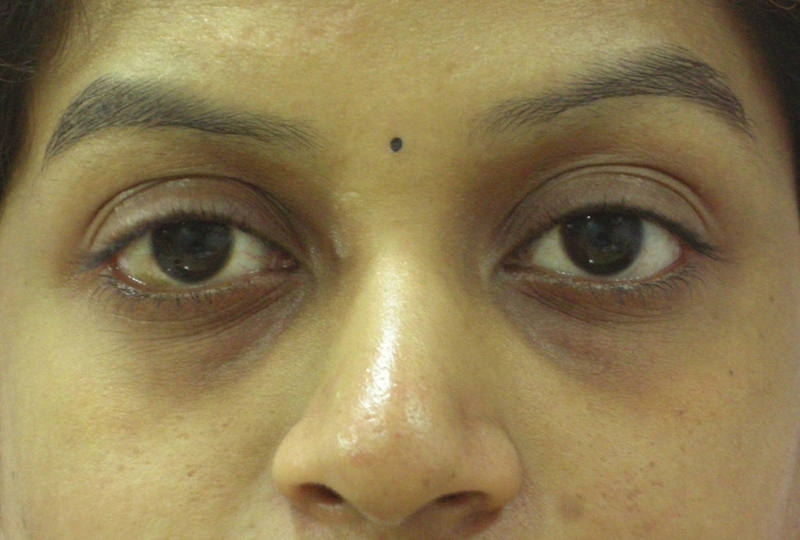 Vedamurthy M. Standard guidelines for the use of dermal fillers. Indian J Dermatol Venereol Leprol 2008;74:23-7. 32. Rzany B, Cartier H, Kestermont P, Trevidic P, Sattler G, Kerrouche N, et al. Correction of tear troughs and periorbital lines with a range of customized hyaluronic acid fillers. J Drugs Dermatol 2012;11:S27-34. 33. Sherman RN. Avoiding dermal filler complications. Clin Dermatol 2009;27:S23-32. 34. Andre P. New trends in face rejuvenation with Hyaluronic acid injections. J Cosmet Dermatol 2008;7:251-8. 35. Kim JE, Sykes JM. Hyaluronic acid fillers: History and overview. Facial Plast Surg 2011;7:523-8. 36. Brody HJ. Use of hyaluronidase in the treatment of Granulomatous hyaluronic acid reactions or unwanted hyaluronic acid misplacement. Dermatol Surg 2005;31:893-7. 37. Coleman SR. Avoidance of arterial occlusion from injection of soft tissue fillers. Aesthet Surg J 2002;22:555-7. 38. Donofrio LM. Fat distribution: A morphologic study of the aging face. Dermatol Surg 2000;26:1107-12. 39. Monheit GD, Rohrich RJ. The nature of long-term fillers and the risk of complications. Dermatol Surg 2009;35:1598-604. 40. Busso M, Voigts R. An investigation of changes in physical properties of injectable calcium hydroxylapatite in a carrier gel when mixed with lidocaine and with lidocaine/epinephrine. Dermatol Surg 2008;34:S16-23. 41. Fagien S. Variable reconstitution of injectable hyaluronic acid with local anesthetic for expanded applications in facial aesthetic enhancement. Dermatol Surg 2010;36:815-21. 42. Hirsch RJ, Carruthers JD, Carruthers A. Infraorbital hollow treatment by dermal fillers. Dermatol Surg 2007;33:1116-9. 43. Rzany B, Becker-Wegerich P, Bachmann F, Erdmann R, Wollina U. Hyaluronidase in the correction of hyaluronic acid-based fillers: A review and a recommendation for use. J Cosmet Dermatol 2009;8:317-23.